Published: Oct. 30, 2017 at 06:53 p.m. 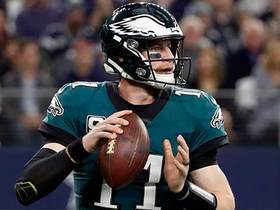 Updated: Nov. 1, 2017 at 02:46 p.m.
Tony Romo is the NFL's MVP halfway through this strange season. No one has done more to elevate the game or those around him than Romo, the rare sports figure everyone can support. In a year where so many of the national commercials feature players out for the long haul -- J.J. Watt, Aaron Rodgers and Odell Beckham Jr. -- no one's star has shone brighter than Romo's, in his first year serving as an analyst on CBS' NFL broadcasts after a decade-plus tenure as quarterback of the Dallas Cowboys. His early-season penchant for predicting plays became a bigger story than the plays he was calling. His narration of a cat running across the field Thursday night was more memorable than anything else in Baltimore's 40-0 shutout victory. Even the cartoon version of Romo inspires weekly memes. NFL.com superstar Chris Wesseling enacted the Tony Romo Rule when going back to study games on Gamepass. Condensed versions are appropriate for every game but the Romo assignment, which deserves a full broadcast rewatch, because Chris doesn't want to miss anything. "He's sports' first choose-your-own-adventure tour guide," Chris texted me. Watching a game with Romo is like putting on a virtual reality helmet that can put you into the mind of an NFL quarterback. -- How new Bengals offensive coordinator Bill Lazor helped the offense by using traditional third-down pass protections on first and second down to make quarterback Andy Dalton more comfortable. -- How Dalton was having a great game as a play-caller in the running game. -- How Bengals tackle Jake Fisher was at fault for a protection problem that looked to the casual viewer like the fault of running back Joe Mixon, saving dummies like me from blaming Mixon on the "Around the NFL" podcast. -- How Pittsburgh's upback called for the Steelers' fake punt in the fourth quarter on his own. My favorite moment of the telecast came when Romo relayed a story from Ben Roethlisberger in which Big Ben once tried to soften up notorious Bengals linebacker Vontaze Burfict by telling Burfict, "Hey, my wife's praying for you." "Uhhhh ... Hey, tell your wife I'm praying for YOU," Burfict responded, according to Romo, who was doing a Vontaze Burfict impression that could have gone wrong a million different ways but somehow worked, just like when Romo ad-libbed a fantastical fake conversation bit between Roethlisberger and Antonio Brown in the same game. It's almost easy to take moments like this for granted before remembering this never happens on other broadcasts. One gets the sense Romo takes full advantage of his preshow meetings with players and does his homework, because he can wax philosophic about end-of-the-roster players. He's enthusiastic like a fan calling out a GREAT third-down conversion by Dalton that would otherwise slip under the radar, but he also isn't shy about pointing out when Dalton isn't seeing the field well, like during Cincinnati's Week 3 game against Green Bay in Lambeau Field. Romo is the first-half MVP in part because of the time football fans spend with him. As refreshing as Deshaun Watson's emergence has been, Romo gets a national audience once or twice a week and doesn't spend any time on the sideline. The past few months have served as an introduction to this generation's John Madden, the beginning of what's going to be a long-term relationship with football fans. In that Week 7 contest, the Bengals' defense forced a third-down stop with five minutes left to preserve a two-possession deficit. This play came well after even the most ardent Bengals fan had likely given up hope, but Romo reacted with the intensity of a quarterback who was part of many wild endings in his day, like a fan who didn't want the game to end just yet. 1) Week 7: Raiders 31, Chiefs 30. The five-play finish was unlike anything the NFL has ever seen. The rest of the game, which included Marshawn Lynch's ejection and four touchdowns of over 35 yards, was dramatic from the start. The game featured eight total lead changes and a feel of desperation from Oakland's side. The Raiders may not be good enough to make it count in the long run, but Romo and Jim Nantz's presence on a national game puts this one over the top. 2) Week 8: Seahawks 41, Texans 38. It's a bummer that so little of the country saw this game in full, with Cowboys-Redskins in the national Fox window. If you could somehow time-travel to show the tape of this game to a football fan stuck in the 1970s, the improvisational magic displayed by Deshaun Watson and Russell Wilson could make his or her brain explode. 3) Week 5: Packers 35, Cowboys 31. This game is marked by a tinge of sadness in retrospect, given the broken collarbone Aaron Rodgers suffered in Week 6. But I'll never tire of watching perhaps the most talented quarterback of all time at the top of his game. 4) Week 3: Rams 41, 49ers 39. This game stood out for being an absolute surprise, a necessary jolt of life after a slow start to the season and the clearest indication that we were in a new land where the Rams are one of the most entertaining teams in football. 5) Week 3: Patriots 36, Texans 33. Sue me if all the top games happen to be shootouts. You find the low-scoring classic this season and get back to me. This was the day Deshaun Watson showed he was different from all the Texans quarterbacks who came before him. The rookie gets extra points for bringing out the best late-game heroic greatness in opponents Tom Brady and Russell Wilson. Buffalo Bills defense: At what point is it safe to believe something special is happening here? Under coach Sean McDermott's leadership, the Bills traded away a former Defensive Rookie of the Year candidate (cornerback Ronald Darby), a recent second-round pick (linebacker Reggie Ragland) and a $100 million defensive tackle (Marcell Dareus). They were missing two key starters from their no-name secondary on Sunday against Oakland and proceeded to pummel the Raiders, 34-14, by winning the turnover battle, 4-0. In turnover differential, Buffalo is at plus-14 on the season. The bounces that routinely went Oakland's way last season during a string of close wins now are landing in Buffalo. But this is a defense that makes its own luck, with sound tackling and few big plays given up. McDermott deserves much of the credit for the secondary, where former Packers safety Micah Hyde added to his league-leading interception total (five) against Oakland and Defensive Rookie of the Year candidate Tre'Davious White largely shut down Raiders wideout Amari Cooper. 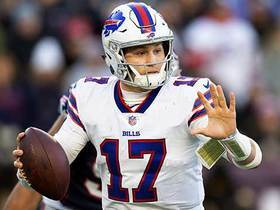 Quarterback Tyrod Taylor and running back LeSean McCoy provide just enough big plays on a Bills offense that has been notably lacking in big mistakes despite the presence of a ragtag receiver group. Scouting in free agency and the draft has been key, but self-scouting helped the Bills just as much. Old standbys like pass rusher Jerry Hughes and defensive tackle Kyle Williams fit perfectly in this defense. Preston Brown, who was expected to be a forgotten man this season, has been a steady presence at middle linebacker. This is a band of overachievers, and Dareus simply didn't fit. Perhaps the turnover rate is unsustainable over the long term; just ask the Raiders if magic necessarily carries over from one season to the next. But for a fan base suffering through the longest playoff drought in the four major sports, the impact having at least one season of magic should not be underestimated. New England Patriots offense: It's crazy how consistent the Patriots' offense has been this season, despite looking completely different each week. The unit has transformed from a bombs-away unit early in the season to one that possesses the ball for long stretches to keep the leaky Patriots' defense off the field. Through it all, New England is the only team in football to gain at least 370 total yards in every game it has played this season, despite the running back rotation changing on a weekly basis and despite five new skill-position players getting significant snaps, including the team's leading rusher (Mike Gillislee) and receiver (Brandin Cooks). That's the power of Tom Brady. Pittsburgh Steelers defense: The Steelers are the best team in the NFL because they are now the most complete. Pittsburgh entered Week 8 ranked in the top five in offense and defense in Football Outsiders' DVOA. No other team ranked in the top 10 in both. The young talent on defense has helped lift the Steelers to No. 2 in points allowed and No. 2 in net yards-per-passing attempt allowed. They are hard to pass against because the pass rush can come from any spot on the defensive line, or from blitzing linebackers Vince Williams or Ryan Shazier. The secondary, which had so long been the organization's weakness, boasts impressive depth, with second-year safety Sean Davis, cornerback Artie Burns and surprise slot cornerback Mike Hilton taking turns making big plays. Even in a game where the Steelers allowed Detroit to go up and down the field, it was the defense that got quick pressure on Lions quarterback Matthew Stafford from a three-man pass rush on the key fourth down. Late in Pittsburgh's Week 7 win against the Bengals, with the Heinz Field crowd roaring after another Bengals three-and-out, it occurred to me that the Steelers faithful was never entirely comfortable with the pass-first Todd Haley era of Steelers football. Having a defense that just gets you by is not the Pittsburgh way. For the first time this decade, Mike Tomlin has a defense that looks championship-ready.